Michael Siminovitch, director of the California Lighting Technology Center at UC Davis, wasn’t looking for enlightenment when he wandered into a Buddhist temple in Thailand a few years ago. He was touring Thailand as a distinguished visiting professor at King Mongkut’s University of Technology Thonburi’s school of architecture. He’d never been to a temple in his life. The temple was a highly crafted, architectural marvel, Siminovitch said. He was especially enthralled by its interior spaces: Reds, golds and earth-tones were illuminated by candle flame and warm incandescent lights, saturating colors to perfection. Siminovitch said it was the most color-intense indoor space he’s ever seen. It was his “aha” moment, leading his research firmly in the direction of restoring high color quality to energy-efficient lighting. Now Siminovitch, co-director Konstantinos Papamichael and other researchers at CLTC are ushering in a new era of lighting that merges color quality with energy efficiency. The CLTC has a long history of testing “next big things” on the UC Davis campus, which serves as both living laboratory and playground for the center. It has brought an array of energy efficient lighting to the university’s parking garages, classrooms, hallways, stairwells, offices, bike paths and even soccer fields, resulting in 60 percent energy savings with the campus’ Smart Lighting Initiative. UC Davis parking garage lighting retrofit. When the center taps into a promising solution, its sound reputation has earned it the ear of lighting manufacturers and state energy regulators. Many of CLTC’s recommendations become state building standards, creating a ripple effect of energy savings. 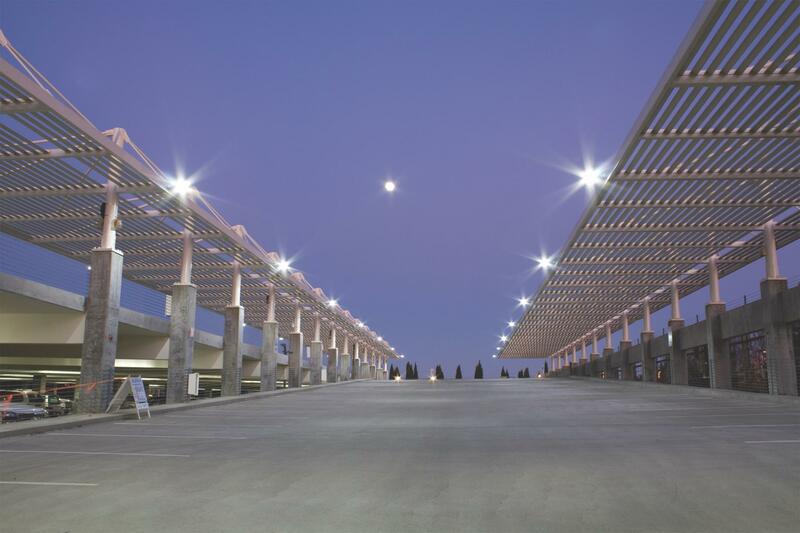 Adaptive lighting for parking and exterior lighting has been applied widely throughout California, including the UC campuses. Such efforts support UC’s Carbon Neutrality Initiative, which commits UC to emitting net zero greenhouse gases from its buildings and vehicle fleet by 2025. A new lighting quality standard conceived by the CLTC called the California Quality Specification was adopted by the California Energy Commission in 2015. Lamps that meet the standard are now available in the marketplace and are eligible for rebates. Effective this past January, new homes built in California must have lighting that meets the California Quality standard. The CLTC created the California Quality Specification to help ensure that energy efficient LED lighting doesn’t succumb to the same fate as compact fluorescent light bulbs, or CFLs. The CLTC is tucked away in a quiet building on the eastern edge of Davis. With fully constructed mockups of hospital rooms, kitchens, art studios, a futuristic office, boutique store, and its own “bulb room,” it and the UC Davis campus itself are the testing grounds for lighting innovations that have spread throughout the state and beyond. Inside the center, Siminovitch stands before a divided box containing two light bulbs. He places one hand beneath a light in the first section of the box and his other hand under a light in the second section. As a side-by-side comparison, one hand looks distinctly more, well, human than the other. The skin tone is warm, while the other hand appears more sterile. Both bulbs are energy efficient, but only the second one displays high color quality — the one that meets the California Quality Specification. LED lamps meeting the standard will be deployed in future relighting and new construction efforts at UC Davis, beginning with design classrooms as a pilot project later this year. Perhaps the full-color experience will help spark new aha moments for the design students working under the lighting, while also conserving energy. In the early 2000s, CFLs became the poster child for the greening of America. The problem was, consumers didn’t fully embrace CFLs for their homes. They missed the color, warm quality, longevity and dimming ability of incandescent bulbs. Although CFLs have improved since their early days, those initial bad impressions stuck with consumers. The national adoption rate for CFLs reached only 10 to 15 percent; 20 percent in California. What good is an energy efficient light bulb if nobody uses it? What good is an energy efficient light bulb if nobody uses it? Consumer distaste for CFLs goes way, way back – to the sun, to fire and the color red, to human evolution. Circadian-sensitive lighting helps bridge that evolutionary dissonance. Blue wavelengths — found in CFLs, smartphones and screens, streetlights, and most LEDs — tell the brain to wake up and suppress sleep-inducing melatonin. Red and amber wavelengths — found more in incandescent lighting and, increasingly, LEDs — help produce melatonin and encourage sleep and rest. Scientists have begun linking blue light at night to a variety of health issues associated with the suppression of the sleep-inducing hormone melatonin. Increased exposure to street lighting and electronic device screens before bedtime may exacerbate the issue. Humans haven’t evolved to embrace such harsh lighting, and CLTC researchers see no reason why we should ever have to. Circadian-friendly lighting mimics the rising and setting of the sun, gently adjusting throughout the day from the blue to the red spectrum. CLTC has been introducing this amber-toned lighting into hospital rooms and corridors, and to the Honda Smart Home west of campus. They are also developing guidelines to reduce blue content and glare of exterior lighting on the UC Davis campus, and are working with the City of Davis to deploy energy-efficient, circadian-friendly LED street lighting.